The most convenient entrance to DIA 2017 is Gate 4, at 2301 South Martin Luther King Jr. Drive, adjacent to the entrance of the Hyatt Regency McCormick Place. 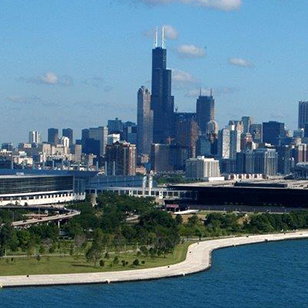 The Windy City is a premier destination for business, entertainment, sports, and leisure. The city and its myriad of surrounding neighborhoods offer exciting opportunities for everyone. Discover Chicago’s world-class museums, restaurants, theaters, tours, and more! United and Delta Airlines are offering DIA 2017 attendees special meeting discounts of 2-10% off published fares, based on the booking class of service. Registration will be in the South Building of McCormick Place. The most convenient entrance to DIA 2017 is Gate 4, at 2301 South Martin Luther King Jr. Drive. GO Airport Express is offering DIA 2017 attendees a 10% discount on shared ride services, express luxury sedans, and limo services from both the O'Hare and Midway Airports to downtown Chicago hotels. Please note that the shared ride shuttle stops at various hotels and is not a direct service to your hotel. Make a reservation online (discount is only available through this link). DIA 2017 hotels are located approximately 17 miles from O’Hare International Airport and 11 miles from Midway International Airport. Taxi fares to/from O’Hare range between $50 and $60. Taxi fares to/from Midway range between $30 and $40. Taxi stands at both airports are located outside of the baggage claim area. Click here to calculate the cab fare using Chicago taxi rates. Estimates may vary. The Chicago Transit Authority (CTA) operate buses, commuter trains, and rapid transit throughout the metropolitan area. The CTA offers a 24 hour rapid transit train (the Blue Line) from O’Hare Airport to the Chicago Loop area for $5. The Blue Line is located in the lower level between terminals 2 and 3. Travel time to the downtown hotels is approximately one hour. The Orange Line from Midway Airport to downtown is accessible by following airport signage to the station, and operates from 4:00-1:00AM on weekdays and 4:30-1:00AM on weekends for $3. Travel time to the downtown hotels is approximately 35 minutes. Around-the-clock CTA travel information and maps to various locations in the city are available by calling +1.312.836.7000 or visiting transitchicago.com. Click here for directions to Lot A, which is the most convenient entrance to DIA 2017, with covered walkways leading directly into the South Building of McCormick Place and the Hyatt Regency McCormick Place Hotel. This is the only garage with overnight parking. The parking rate is $23 for up to 16 hours and $36 from 16-24 hours (credit cards are accepted at the parking ticket kiosks). There are no in-and-out privileges. Lost tickets will be charged the $36 (overnight) fee per day. DIA provides complimentary shuttle service between the official DIA 2017 hotels and McCormick Place in the morning and at the conclusion of events each day. Please note that you must be staying in an official DIA 2017 hotel in order to utilize the shuttle. Shuttle passes will be issued at hotel check-in, and will be strictly enforced. A detailed shuttle schedule will be posted closer to the meeting date.